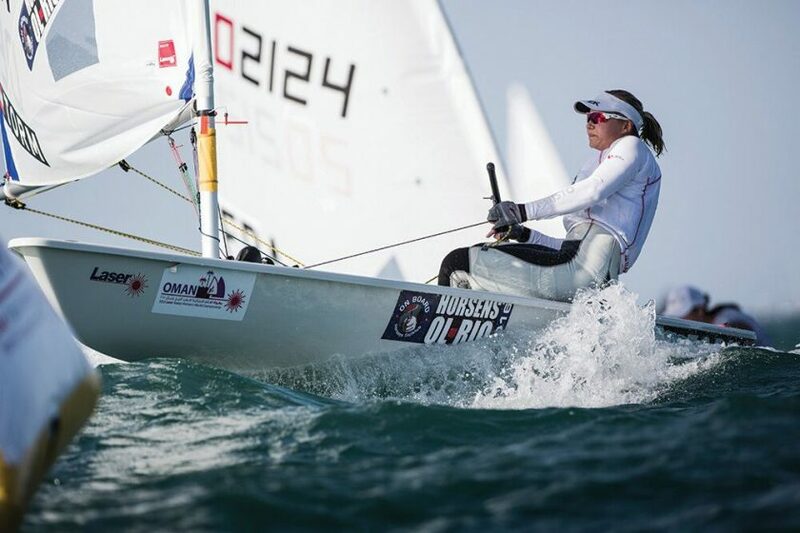 Jeff Martin talks to the winner of the Laser Radial Women’s World Championship 2015. It feels very good, I’m so happy about the things I’ve been doing on the water for the past weeks so it feels awesome. It was tough, what were your thoughts going into the last race? I had a lot of nerves, I didn’t know if we were going to do one or two races, so I was trying to calm myself down. My discard was eight so the worst I could do was eight points and that helped me a little bit in the last race. I got a great start and was doing very well. Then the left side came and it was just uphill from there, but I was fighting until the end. Did you have an eye on where everybody else was? Was it on the first windward leg that the left side became favoured? Yes and I was very close to Evi. I tried to stay close to her but at the same time I was trying to sail my own race. There were so many people who could take the title, I couldn’t defend against everybody! So I was trying to just sail as fast as I could. Did you get nervous as you were going round the track? A little bit, but after the start I felt really good. I could feel that I had speed in my boat so the nerves were getting less and less. So overall, what do you think helped you most to win what is a really hard event? I think it’s the mental training I’ve been doing with my sports psychologists, especially how to start a regatta really well and not let nerves take over. I’m working hard to follow my plan instead of my nerves saying ‘ah you shouldn’t start here because you’re not good enough’. The best thing about this event was that I could do that all the way. How long have you been sailing the Laser Radial? Since 2009. Before that I was sailing the Europe dinghy. Was that with the dream of going on further and trying to go to the Olympics? Yeah. In 2012 I went to Weymouth for the Games and that was a dream come true. At that time I wanted more, I wanted to be fighting for the medals also. So my dream became to be a World Champion and win a medal in 2016. Well you’re certainly doing that! What are your plans now? My plan is to train as much as I can in Rio, and then we also have the Olympic trials for Denmark, so obviously I have to go to some of the Sailing World Cup events and the Laser World Championship next year. So you still have to qualify for Rio? Yes. We qualify as a nation but Sarah Gunni and I have a trial going on between us. So I have to win that. How long is the trial? What have you got to do from now on in? The trial for us is here, Miami and the Worlds next year in Mexico. If you win you get twenty points, if you’re second you get nineteen points. Obviously you have to be at twenty to get points and then at the end when we finish Mexico, it’s the person with the most points that goes to Rio. Do you train with Sarah? have the same coach. I think it’s very good and that’s also what helped me win this championship, it is because of her! Because she is pushing me. What do you do when home? Now I have one week at home, just chilling. I also have school – I’m studying sports science! Actually I have a report to hand in on Monday so it’s going to be a very busy weekend! I would have to say meat, potatoes and gravy – that’s my favourite! It’s mostly sing-along songs, something I can sing with, I love to sing! Do you sing while you’re sailing? Thank you very much indeed and congratulations on your win!